[ENDED} The Gencon 2013 Millennial Milestone Giveaway! This contest is now closed. We announced the winners here. We’ve been tweeting about it for a long time; when we reach 1,000 followers on Twitter, we’ll give something away. Like a board game, or something. Well, we did it, and we did it before Gen Con, which means we picked up some hotness from the show and now we’re going to GIVE IT TO ONE OF YOU. These are the actual copies the winner(s) will receive! The prize? Well, actually, we have 3 prizes. That means we pick 3 winners – a First, Second, and Third place winner. First place gets to choose their choice prize out of the 3. Second place gets to choose from whatever is left, and Third place gets the last prize. So, what are the prizes? First, we’ve got a copy of Asmodee’s brand-new steampunk hit, Spyrium. In case you hadn’t heard of it, it’s a worker-placement, resource-management game that’s all Euro. (You can read Lenny’s first impressions here.) It’s a brand-new release, and it’s pretty hot right now. Secondly, we’ve got a copy of Sentinels of the Multiverse: Enhanced Edition, including 8 promos: Freedom Six, Dark Visionary, and Eternal Haka. This has been generously provided by Greater Than Games, because they are awesome. This isn’t a brand-new game, but it is a pretty excellent co-op and, you know, superheroes! You can read our review of it here. This is a photo of my copy. The copy you receive (if you win it) will be new in shrink. 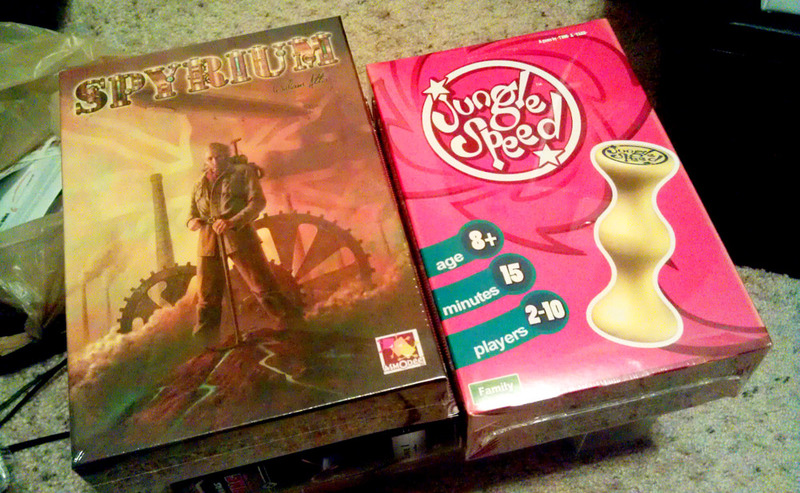 Finally, we’ve got another Asmodee game–Jungle Speed. It’s a family-friendly party game good for kids and groups if you’re just looking for a quick and silly way to pass the time. I’m not really sure where the “jungle” comes in, but it’s definitely speedy. And a little silly. So if you’re less of a heavy strategy-gamer and more of a family gamer, this prize is for you. Winners will be determined by a random drawing from all entrants. Currently there is a first place, a second place, and a third place prize, but hey, we reserve the right to add more prizes later on. Also, note that we will ship the games free to US addresses; internationally, we’ll pay the first $15 of shipping costs. This contest ends Friday, August 30, at 10 p.m. CST. In the meantime, thanks for your support. If you’re new here, check out our full list of reviews, and our popular guides to gaming to help you get started. Here’s how to enter: leave a comment on this post, send us an e-mail, tweet at us, leave a Facebook or Google+ comment; really, any available method you know of to communicate with us. What sort of message should you leave? Well, just tell us about something you like. There’s a lot of negativity in the world, and we like to encourage positivity wherever we can. So, just tell us something good. Your favorite review on our site, for example. Maybe your favorite reviewer out of the four of us. Your favorite board game. If you’re not good with words, send us a picture. It doesn’t matter. Just let us know something you like. And, it’s sad that we live in a world where I have to say this, but let’s try and keep it family friendly, okay? Comment: Just leave a comment below. Easy as pie. Eating it, anyway. Facebook: Leave a Facebook comment on our Facebook wall or on the contest posting. Google+: Comment on the G+ post about the contest. Something important to note; you are not required to “share” or “retweet” or “encircle”(whatever G+ does) or “forward to a friend.” We’re keeping it simple; however, it does help us a lot when you spread the word about us around. Doing so will not increase your chances of winning, but it will help us grow, and that’s a good thing. So please, consider sharing/tweeting/+-ing (or whatever) this contest and our blog. Note: Usually we restrict these things to US Only because of the cost of the shipping, but we came up with a compromise: this contest is open to anyone in the WORLD, but we will only cover the first $15 in shipping to anyone that doesn’t have a US address. We figured that would be better option that just excluding international fans entirely, so now you know the conditions and you can decide for yourself it you want to enter. Here’s some more legal stuff: No purchase necessary to enter this contest. This contest is in no way affiliated with Asmodee (we just picked up their games). 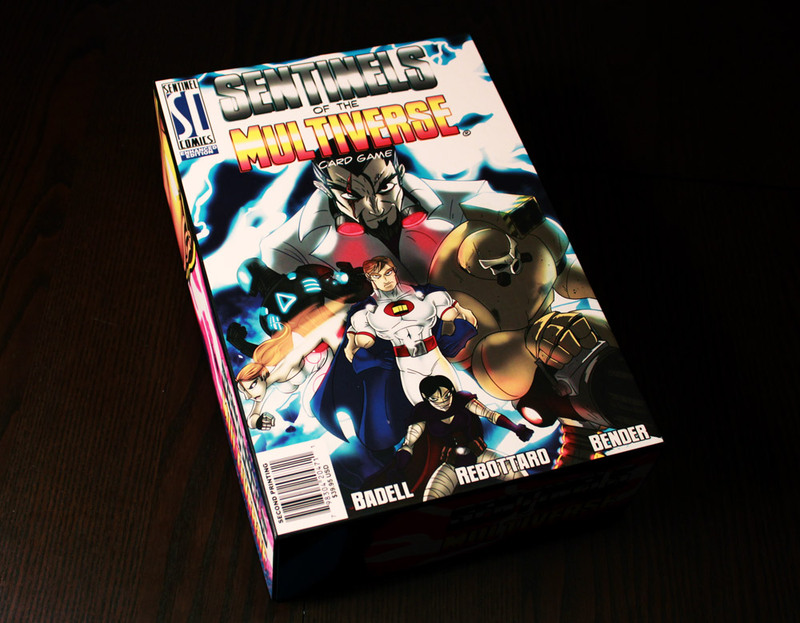 Sentinels of the Multiverse: Enhanced Edition was provided by Greater than Games (thanks!). This contest is open to anyone the world, with one caveat; for anyone outside the US, we will pay the first $15 in shipping, and you’ll cover the rest. (We will do our best to use cheap shipping options, but it’s just too expensive for us to cover shipping fully. We figured this option is better than just excluding our international fans entirely. If you have a US address we can ship to, we’ll cover the shipping.) Contest will end at 10 p.m. CST on Friday, August 30. All entries will be tabulated, and a random winner will be chosen through use of the website random.org and announced within 72 hours. Currently two prize winners will be chosen, a first prize winner and a second prize winner. The first prize winner will choose between the available prizes. The second prize winner will receive the remaining prize. We reserve the right to add more prizes, and in doing so, draw additional winners. Winners will be contacted via the method they used to enter the contest–Facebook for Facebook, tweet for Twitter, etc. We will also announce the chosen winners in a blog post. The winners will have 48 hours to respond once they have been contacted/announced. If a winner does not respond, they will be removed from the line. All other chosen winners will move up one slot, and a new winner will be chosen to take the last slot. We reserve the right to modify the rules or cancel the contest at any time. We will only do this if we discover that something lacks clarification or some element of the contest is being tampered with or taken advantage of. Play it honest, guys, this is for fun and to reward you guys for helping us out. One entry per person. The four writers and their families are not eligible to win. I really like the nice photos you take of all the games you review. Recently started following you, and I enjoy the weekly news posts. Keep them coming. It’s okay, you can admit that FarmerLenny is your favorite. It won’t hurt our feelings too much. I love Sentinels, and whoever wins it is a very lucky person indeed! I know I can’t enter the contest, but I want to be part of the ++GROUP HUG++ !!! I really enjoyed my first GenCon. Found your site looking for wrap-ups posts. I found y’all by a post that linked to your Gencon review from reddit. I know that is not a long period of time but since them I’ve read ten reviews and really enjoyed them. I’ve bookmarked your page and have been eyeing my next buy. My collection is small so far but will grow and guidance from y’all is a big help. Hey Kyle, you’ve been chosen as a winner! Please see the post: http://www.islaythedragon.com/2013/09/winners.html and get in contact with us as soon as possible. Nooo, stopped paying attention after 72 hours had passed, thinking others had won. Love your kid oriented articles lately. Gaming with your kids is one of the best activities for families! I’ve only just discovered your blog, thanks to a post on BGG, but like what I have seen so far. I’m looking forward to spending time reading through more of your posts. Keep up the good work. I’m a little bummed I can’t win the prizes. I’m regretting not picking up my own copy of Spyrium at Gen Con. Good luck to the rest of you! Just found you guys and am loving the posts! Got the impression from one post that you guys are Chicago area gamers… That true? Ish. Two of us live in the west suburbs. Ah cool, well if you ever feel like venturing to a cool game shop a little south, maybe I’ll see you at The Wandering Dragon in Plainfield (no affiliation… Just my FLGS!) They’re a very family friendly shop and it seems like you have a lot of posts on family and kid’s games. I’ve visited the Wandering Dragon. It is a pretty sweet shop and they’re definitely vibrant with activity. I wish I lived closer, but it’s about a 45 minute drive from where I live, and there’s another game store – the Game Knight – in Naperville that is much closer. Much smaller, but growing. An iSlaytheDragon meetup could be cool. We’ll have to have a discussion about that back at HQ and see what we can do. Ah yeah that’s a drive. It’s a great shop, responsible for my growing hobby collection, and they’re about to move to a bigger space! I’ll have to check out Game Knight. I live almost equidistant between downtown Plainfield and Naperville. Cool to have another shop to check out! It’s a nice store and the owner is pretty friendly. It’s pretty magic-oriented right now, but they are trying to grow and expand. They have a pretty good board game library you can use any time. I just wanted to say your pre-GenCon post really helped me be ready for my first visit. Thanks! I love the book Author Ted Dekker, I think it somewhat relates to board games, in that he’s a fantasy/scifi author that tells amazing stories, and everyone should look him up. I’m so excited to see what new kickstarters are coming out this fall, but sad because my budget won’t allow me to back more than 1-2 more this year. Here’s a picture of my gaming group and I with all of the games that we have (as of when that picture was taken — I’ve added at least five new games to my collection since!). Congratulations!! Sleep first while you can, though…gaming will come later!! I’ll second that congratulations! My 21 month old daughter just started asking me the other day to “play the game”. It was one of my proudest moments as a parent. Best of luck with your little gamer! Hey Kolby, congrats! You’ve been chosen as a winner. Please see the winners post: http://www.islaythedragon.com/2013/09/winners.html and contact us as soon as you can via email to claim your prize. Thanks so much guys! Great contest! I love the way boardgames brings people across the generations together. Recently I was playing an Axis & Allies game were the players were born in the 50´s, 60´s, 70´s, 80´s, 90´s and 00´s. There´s something beautiful with the fact that you can bring people from half a century around something like a boardgame. I love games. Board, card, roleplaying, video, I don’t care, they’re all awesome. They’re a way to hang out with friends, meet new ones, and stretch the creative muscles. You can never have/play too many game! Just found the website through a FB post. Can’t wait to read more around this blog. I’m a huge fan of all your guides to different things (games, mechanics, teaching players, etc.) and I look forward to seeing more of them in the future. Thanks for sharing! We may not have a review of Power Grid but it’s a favorite of mine and I’m pretty sure FarmerLenny as well. I’ll be doing a guide to Network Building games next week of which both Power Grid and Ticket to Ride are excellent examples so stay tuned. Was introduced to your site by Eric’s Gencon round-up on BGG. Enjoyed your posts, thanks. I like GenCon too – especially for my kids, who have a great time there. Thanks for the contest. Could you give us a name or something to signify who you are if you happen to be chosen as the winner? Such a wonderful sentiment. Thanks for being so inviting to new as well as old people in the community. Let’s spread the love! Way to go guys! This is an excellent idea! My positive is the giving spirit of the board game community. I can’t get enough of it! Off to plug you guys on Twitter now! Just found you guys, can’t wait to dig in the archives! If only I had more money for games, but that being said what I really want is more time to play the games I have with my wife. Thanks so much for the contest. I wouldn’t have found the site without it. Now to explore. Thanks. Thanks for the contest, I’ve enjoyed your site – especially the reviews, although your news articles are really good too. I really like having discovered a good solitaire game recently, Lord of the Rings LCG. The huge variety of quests available is incredible fun. The main thing is it worked great as something fun to play right after my son was born a few months ago. A great way to get some gaming in, while being exhausted, of course. Sentinels of the Multiverse is awesome! I would be super psyched to win a copy. (I played an excellent game with the local board game group). I’m glad I’ve stumbled across your site! Im super excited to try Spyrium out. There seems to have been a huge surge in steam-punk themed games lately, and that is A-OK by me. Love the site. I’m truly blessed with so many game groups to join up with practically any day of the week. Gaming at the house is becoming more and more of an option as well. The community that gaming creates is outstanding! There’s no better tour guide while working out of town than a fellow gamer. #InstantFriends. I like playing games with family & friends. Sitting down and slowing down and laughing and enjoying the time is great. What game? It almost doesn’t matter. It’s the ole, it depends on who is playing, how much time we have, so many other variables. I liked the Carcassonne series. Thanks in advance. Thanks for the contest! Always appreciate another reviewer’s perspective. Spyrium was on my list to try at GenCon, but it was always packed. I like a good game give away. An winning said game give away even more. Sentinels is, indeed, a fantastic game. A+ would play again. Spyrium looks pretty neat too.